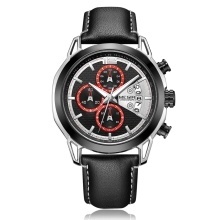 MEGIR 2071 is a fashion men watch. The watch is suitable for all kinds of occasions. It shows your unique style. Three workable buttons for adjusting. Mineral glass dial window, alloy and alloy case, leather strap. Functions: Chronograph, luminous hands, calendar.